I have taught a variety of Biology courses in the past. Some of these I did as an adjunct instructor during my postdoctoral training. Others were done as a tenure-track instructor during my time out west. I have also taught a few classes at Ferris that have either been discontinued or reassigned due to load constraints. What follows is a brief description of these classes. BIOL387: Microbiology and Immunology – This three-unit course was taught every semester and was part of the curriculum for the clinical laboratory sciences program at Ferris State University. The lectures served as a brief introduction to the microbial world including microbial structure, function, metabolism, classification, genetics, control of microbial growth and immunity. BIOL472: Proteins – This three-unit course is taught every other year and is part of the curriculum for the Biotechnology program at Ferris State University. The class covers protein structure, function, purification, and characterization with an emphasis on lab applications, problem solving, and trouble-shooting. MICR200: General Microbiology for Health Professionals – This is a general microbiology course for those planning careers in nursing, health care and education, and foods and nutrition. This course offers a broad overview of the structure, function, and diversity of microorganisms with an emphasis on their roles in human health. I served as a laboratory instructor. BIOL220H: Introduction to Bioinformatics – This two-unit, team-taught course is offered during the fall semester to honors students in the department. Topics covered include the nature of biological information, database design and queries, sequence comparisons, phylogenetic analyses, and predictions of structure and function based upon sequence data. One half of the course time is dedicated to using current computer algorithms for actual sequence analyses. 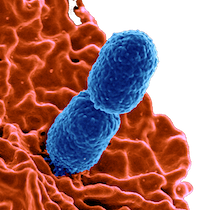 MICR320: Bacterial Pathogenesis – This five-unit course is taught every semester and is part of the core curriculum for Microbiology majors at CSULB. Lectures were focused upon molecular mechanisms of host-parasite interactions in a broad range of human pathogens. MICR471: Bacterial Physiology – This is a three-unit course that is taught once per year during the spring semester. Using a comparative approach, the growth, metabolism, nutrition, and ecology of bacteria and archaebacteria are discussed. Recent publications are used to compare the diverse strategies employed by prokaryotes to adapt to their environment. BIOL696: Research Methods – This three-unit, course is offered during the fall semester for graduate students in the process of completing their thesis. Topics covered include experimental design, data presentation, computer graphics, and technical writing. The class culminates with formal oral, written, and poster presentation of their research. BIO101: Introductory Biology Laboratory – Laboratory sessions included exercises spanning Botany, Animal Physiology, Biochemistry, Genetics, and Molecular Biology. As laboratory instructor, I prepared, presented, and graded all lab materials, quizzes, and practical exams. BIO102: Introductory Biology Laboratory – Laboratory sessions included exercises spanning Botany, Animal Physiology, Biochemistry, Genetics, and Molecular Biology. As laboratory instructor, I prepared, presented, and graded all lab materials, quizzes, and practical exams. NAS185: Microbiology – This four-unit course introduced microorganisms, their metabolism, and involvement in human disease. Emphasis was placed upon prokaryotic metabolism and genetics as well as the molecular and cellular aspects of the human immune system.